Did you know dental cavities are the most common health concern for children and adults worldwide? Fluoride is one of the best and safest ways we can prevent cavities for children and adults alike. Your mouth contains bacteria that feed on the sugars in the foods we eat and the beverages we drink. This produces acid that can wear away the enamel of your teeth, which can lead to cavities. Fluoride protects teeth by making your teeth stronger and more resistant to acid. It not only reduces the risk of cavities, but it can even help reverse early signs of decay. Below are the most frequently asked questions parents ask about children and fluoride at Dental365. My child brushes with fluoride toothpaste. Does he/she still need to drink water with fluoride? Yes. For most people, brushing with fluoridated toothpaste is not enough. Drinking fluoridated water throughout the day bathes our teeth in low levels of fluoride to help them stay strong. That, combined with the more concentrated fluoride in dental treatments, prevents more tooth decay than toothpaste alone. It is also important to note that Nassau and Suffolk Counties do not add fluoride to their water, which makes fluoride treatments at the dentist’s office even more important. Are there any health risks associated with fluoride? No. There is no credible scientific evidence that fluoridated water or dental products contribute to or cause health problems. The only proven risk associated with excess fluoride is a cosmetic condition known as dental fluorosis which is a change in the appearance of the teeth, usually in the form of very faint markings. It is usually detectable only by a dental professional during an exam. Most fluorosis does not affect the function or health of the teeth. 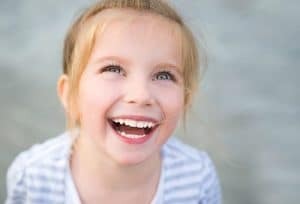 How much fluoride is needed to protect my child’s teeth? Children who consume a nutritious diet, use fluoridated toothpaste properly, and receive fluoride treatments from their Dental365 dentist will get all the fluoride they need for healthy teeth. Parents will want to make sure that children are not swallowing mouth rinse or toothpaste. If you still have questions regarding your children and fluoride, give Dental365 a call today at 844-365-DENTAL. Our team of professionals will be able to address any concerns you may have as a parent and make sure your child is on the right path to wellness.